Pink House is located at 25 Butler avenue in the Camp Ground. 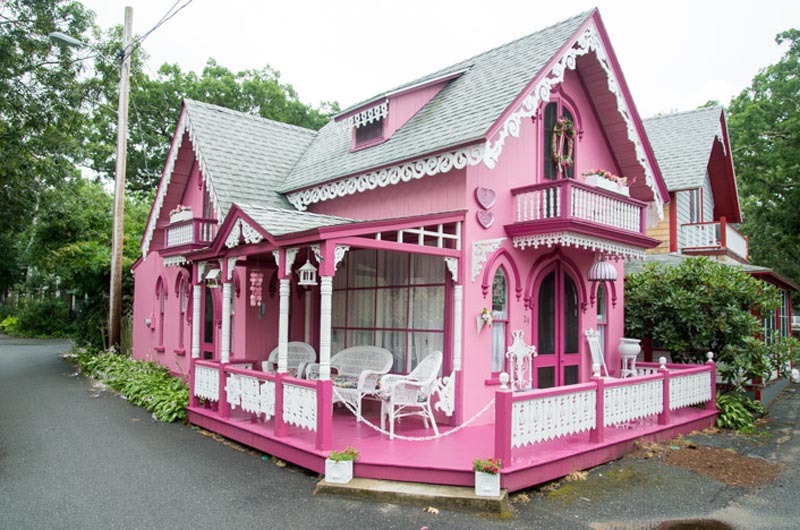 The famous Pink House on the grounds of the Martha’s Vineyard Camp Meeting Association is once again for sale. It is the most photographed of all the many photogenic houses in the Camp Ground. There are actually nine pink houses of varying degrees of pinkness, but this is the Pink House. Pink siding, deeper pink trim and pink throughout the inside! It has not always been pink. It was built in either 1864 or 1866, so it is a very early house for the Camp Ground. The first houses were built on tent platforms and the early cottages reflect their origins by the front windows: Gothic Vs that are meant to suggest the original tent flaps. The first owner, whose name is unknown to me, was the one who embellished it with many types of fancy jigsaw trimmings, which don’t match each other. There are two very old stories told about this trim. One is that the first owner had an affair with the carpenter who did all the trim work around the Camp Ground and he gave her the trim cuttings. The other is that the woman got all the trim at the dump and attached it to her house. This particular cottage has another unusual feature in its large living room window. It was installed in the 1950s by the owner at the time, Jean Spencer, an artist of some note. This type of window is often a feature of an artist’s home. You can see an earlier version in Edgartown at the corner of Davis Lane and School Street where Enid Yandell, the sculptor, kept her Branscomb School of Art for many summers. The first artist to own the Pink House was Lillian Cotton, also known as Lillian Impey ( her married name). Lillian’s art work is very collectable. She owned the cottage in the 1940s. She left Paris where she was trained, and where she met her husband, Arthur Impey, a British Army officer. She spent many years in that city. She must have been quite a glamorous creature. The little girls of the neighborhood, who are now in their early seventies, can remember her sitting in her ornate wicker chair (which can still be seen in the Camp Ground museum) with her friend the Russian emigre Magda Palavonov, who the little girls were convinced was the lost Romanov princess Anastasia. Magda may or may not have designed a cross in the Russian style (now gone) for the altar of the Tabernacle. The little girls might have been overawed by this putative princess, and also by Lillian herself, whom they called Countess Impey, but they also called Lillian Mme de Bedstead because she made a fence for her backyard out of old brass headboards! There is still a fence in the backyard, but I checked and it is wooden and not brass. Alas, the countess died in 1962. The next owner was also an artist named Jean VanVliet Spencer and the one who inserted the out-of-character window. She was from New York and just as Lillian’s art is still collected, so is Ms. Spencer’s. Portraits were her specialty. But the most recent sale of one of her paintings (in 2012) was entitled Still Life with Flowers and featured pink flowers on an ornate pink wicker chair. She was the subject of a retrospective show in 2008 at Trinity Church in the Camp Ground. She is fondly remembered still. Jean is the one who gave the cottage its first coat of pink paint. It was salmon pink until Anita and Jack Welles of more recent date painted the cottage its current deep pink color. Anita loved her cottage, and loved the people who came by and talked to her on her welcoming front porch. She loved the fact that she and Jack signed the offering letter for the cottage on a Valentine’s Day. But she and Jack became ill after a number of years and had to leave. The next owner loved the house, too. She was from Falmouth, and delighted in coming across on the ferry to her pink cottage. My thanks to Nancy Blank and Joan Jecoy — those delightful little girls of not so long ago. I remember when this was the ONLY pink house in the Camp Ground and even as a kid I didn't like the new window when they replaced it. Looked too modern and out of place. I was wondering if one of the owners mentioned in the article was a young woman I remember who sat on the porch and made beaded jewelry. She was very nice and one summer game me a necklace. I remember posing for Jean Spencer in that house as a child. Her portrait of me hangs next to one of my mother painted by Lillian Cotton and to one of my grandmother painted by Jean Spencer. Thank you for making the connection between the two artists.